The Andy Jackson Fund for Access is a charity set up in the name of a legendary Scottish whitewater paddler to help the access situation to interesting rivers for canoeists. Last year a paddler who I respect lots Chris Dickenson posted a rant on ukriversguidebook forum, a common place for people to post rants on. The rant was long but hard to pin down what it was about. One of his concerns seemed to be that the SCA wasn’t giving the money from the guidebooks to the Access Fund as they had pledged. A quick look at the Access Fund entry on the Charity Regulator website shows that the charity does indeed get income every year but that it didn’t have any outgoings until 2012 and even then only Â£662 and in 2013 only Â£500. The only information on the charity is on the poorly maintained Where’s the Water website. There’s no indication of what projects they fund or who their trustees are or who their membership is. Intrigued I sent an old fashioned letter to the address on the OSCR website asking for their latest accounts and annual report. After a couple of weeks I got the accounts and report ending 31st March 2013 dated December 2013. As of 2013 there’s 4 trustees, Bridget Thomas (chair), Robin Cole, John Picken (treasurer) and Ron Cameron. Eddie Palmer’s name was on it but has been scored out presumably because he stepped down when he became president of the SCA. Robin Cole was added, presumbly when he took over from Eddy as the chair of the SCA Access Committee. Kenny Biggin stood down, no reason given. 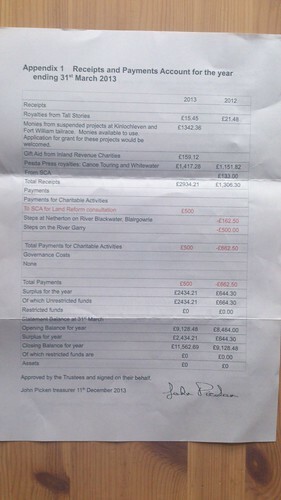 The annual report says they do receive funds from the guidebooks. 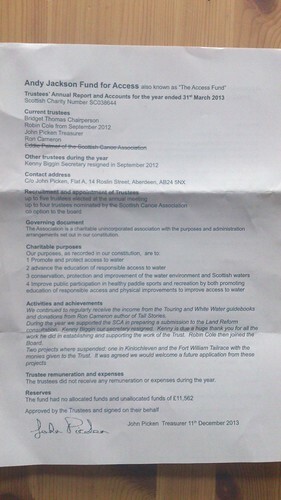 The only activity given in the annual report is that two projects were suspended, Kinlochleven and Fort William Tailrace. There’s no indication of what these projects were or why they were suspended. They have Â£11,562 in the bank. The actual accounts do list some more activities. In 2012 there’s two items marked “Steps at Netherton on River Blackwater” and another marked “Steps on the River Garry” and in 2013 one marked “To SCA for Land Reform Consultation”. And that’s it. No indication that they plan to do anything more with the money they keep receiving from the guidebooks, no modern means of communication like a website or e-mail or even telephone number. No suggestions of what sort of projects they would be wanting to support. I expect that like a lot of volunteer committees the Andy Jackson Fund for Access is made up of people who don’t have the time or energy to give to the project as it deserves or even to ask for other people who could do so. This is a shame as many people buy the books expecting them to go to good caueses when in reality the money is just sitting in a bank account. Chris Dickenson’s rant that they are not being given the dues they are owned by the SCA is quite defaming and wrong. Many SCA committees are made up of volunteers who do a lot of hard work but then fail to show that by updating their pages on the SCA website (the access committee might well but one of them) with the result that people complain about the SCA don’t care or fund whitewater and only cares about sprint/slalom (which gets lots of funding from SportScotland). Here we have rare funding for whitewater paddling that isn’t being used. The Access Fund would benefit greatly from advertising itself and actively asking people to apply for grants.